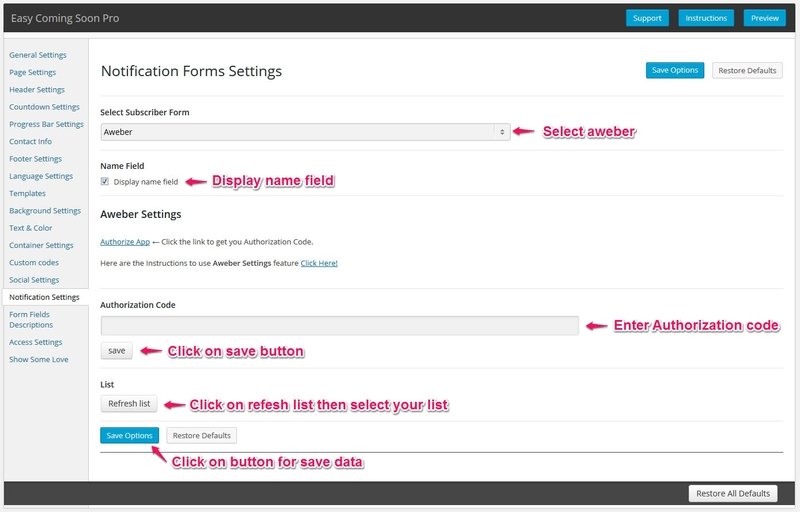 Select Aweber option using dropdown in form setting. You need to Aweber Authorize Code. Click here this URL and login with your Aweber details. After login you can see Authorize code. You need to copy this code and paste in Authorization Code input field then click on Save button. Now you need to click on Refresh List button. If You have created any list in Your Aweber account it will show in list dropdown. Otherwise you need to create list in Aweber. Name Field -> Select checkbox if you want to show name field on form field in coming soon page. Authorization Code-> Paste in the Authorization Code you received when authorizing the app and click Save. List -> You created list in Aweber. Select Your List Option.